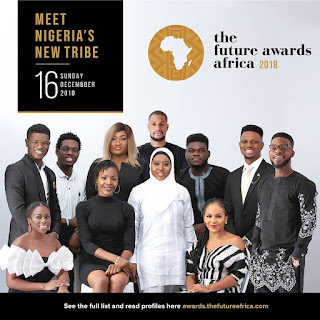 Following the press release released by The Central Working Committee (CWC) of The Future Awards Africa (TFAA) has announced the nominees for the 13th edition of Africa’s biggest youth awards set to hold on 16th December 2018 at the Balmoral Centre, Federal Palace Hotel, Lagos. With 20 award categories this year, the CWC unveiled one hundred (100) nominees which were drawn from young creative minds doing wonders in their various endeavours – representing a new class of innovators, philanthropists, activists, entertainers, technocrats and creators promoting the shared values of creativity, social good, and innovation while making impact in entertainment, professional service, agriculture, business and sports. “Inducting these new set of performers into Nigeria’s New Tribe has been nothing short of inspiring as they have dutifully chosen the path of impact to their community, nation, and the continent,” said Bukonla Adebakin, Chief Operating Officer of The Future Project.